DIAL: Black central dial with large arrow ‘hour indicator’ with outer black circular rotating ring with white dot ‘minutes indicator’. CASE: 35mm x 41mm, Stainless Steel rectangular shaped, screw-down case-back, original Longines plastic crystal with LONGINES COMET printed on the interior. 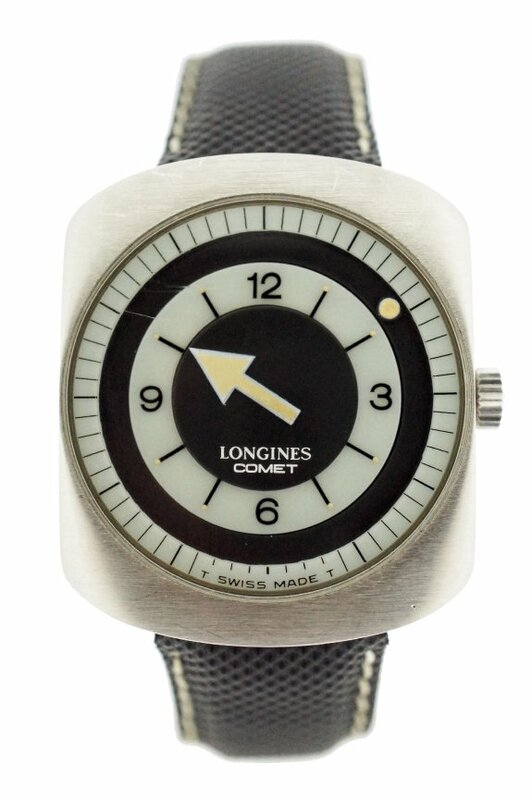 The Longines Comet is a rare and uniquely designed mystery dial produced in the late sixties to early seventies. It is an unusual watch from Longines, featuring a large arrow in the center indicating the hours and an orbiting dot on the periphery for minutes. Both are on revolving discs, making them appear to move without being connected, hence the term ‘mystery dial’. The watch is considered to be uncommon, as the design was seen as ahead of its time, therefore relatively few were produced or sold. Red is thought to be the rarest color, followed by yellow and black, while the most common color was blue. It was also manufactured in several other colors.